The Shoreditch Guardians of the Poor opened Hornchurch Cottage Homes in 1889. They continued in use as children's homes until 1984 - a full 95 years of residential childcare. The cottage homes had 13 houses which could each accommodate around 30 children. Early life in the homes was described in the 1900 novel A son of the state by Williams Pett Ridge . Donated by Ernie Dunsford, this postcard is captioned 'Presentation to Flight Lt. WL Robinson VC at Cottage Homes, Hornchurch Sept. 1916'. Do you know what this event was all about? After puzzling over what this photograph might be about for a long while, we've just received this from Tony B - "Lt William Leefe Robinson (based at Suttons farm airfield, Hornchurch) was the first airman to shoot down a German airship on 2/3 Sept 1916. 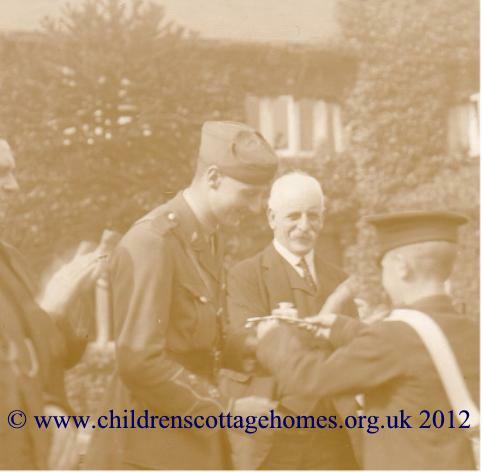 He was awarded a VC a few days later & among the celebrations, nationally & locally, there was a presentation of silver cup to him at the Cottage Homes: there’s a film of this visit on Pathe News I recall." Thanks Tony! Do you have memories of living in the homes at Hornchurch that you would like to share? We would love to hear from you. A great site on the Hornchuch Cottage Homes can be found here. "Although we hold records of both the Romford and Ongar Unions (G/R and G/On), they do not include any records of the cottage homes. We are not aware that records survive elsewhere and we are therefore unable to assist with any enquiries relating to individuals in the homes." More modern case files and documentation, however, may still exist - please let us know if you know where former residents apply to access their own case files. For general information on accessing records, see our section on this. Extensive records of the Hornchurch Cottage Homes can be found in the London Metropolitan Archives in Clerkenwell. These include registers of children and staff, building plans, photographs. Although the Homes are in Essex they were built by the Shoreditch (London) borough, so the records are most there.